Elegant and sophisticated in design the Mini Ella pendant light by Tech Lighting is hand-blown into a perfectly sculpted teardrop-shaped glass shade. The organic glass features a unique thick extruding glass band. 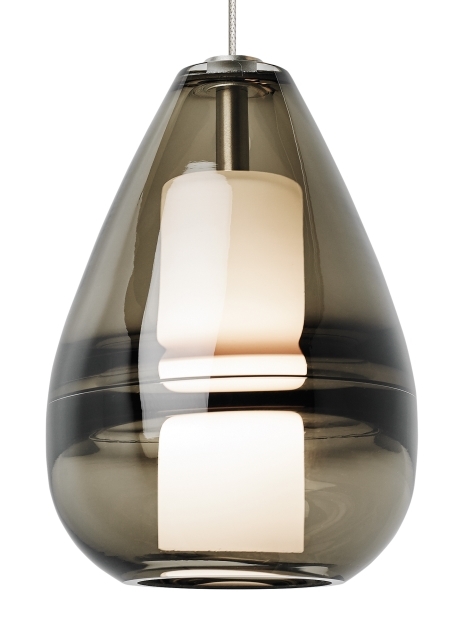 When lit, the serene beauty of this elegant pendant is enhanced by the contrast of the opal glass diffuser. With two modern color options, clear and smoke the Mini Ella exudes modern sophistication making it ideal for kitchen island task lighting, hallway lighting and bathroom lighting flanking a vanity. The Mini Ella comes with your choice of halogen or LED lamping, both options are fully dimmable to create the desired ambiance. For even greater design customization pair the Mini Ella pendant with the Monorail system by Tech Lighting. Includes low-voltage, 50 watt halogen bi-pin lamp or 8 watt, 300 delivered lumen, 3000K replaceable LED SORAA® module and six feet of field-cuttable cable. Dimmable with low-voltage electronic or magnetic dimmer (based on the transformer).